As Virtual Reality (VR) applications gain more momentum recently, the social and communication aspects of VR experiences become more relevant. In this paper, we present some initial results of understanding the type of applications and factors that users would find relevant for Social VR. 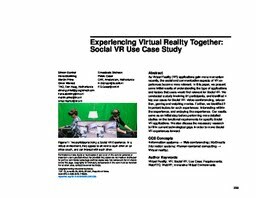 We conducted a study involving 91 participants, and identified 4 key use cases for Social VR: video conferencing, education, gaming and watching movies. Further, we identified 2 important factors for such experiences: interacting within the experience, and enjoying the experience. Our results serve as an initial step before performing more detailed studies on the functional requirements for specific Social VR applications. We also discuss the necessary research to fill in current technological gaps in order to move Social VR experiences forward.